USIC IS AN integral part of my being. I can’t imagine, nor wish to imagine life without it. The sound and rhythm and tone and pitch and movement in unison can stir every human emotion inside me. Especially classical choral music, sung in any language, which appears to have lost most of its appeal in this country except when angels and Gregorian Chant become a fad. I love listening to the music of a good choir. I sang in a good choir once. Father Flanagan’s Boys Town Choir. The experience was one of the greatest God-given blessings of my life. Mom and Dad married at a young age. They had seven children. I was the third child. We lived in a gritty area of Chicago. Dad drank heavily and could not keep a job. Both parents fought constantly. They were divorced when I was nine years old. Mom tried to parent us seven children alone. It was too much, and she abandoned us back to Dad. With no job and a daily passion for beer the situation was hopeless for both him and us kids. At age 11, Catholic Charities intervened. They split us up, and sent five of us kids to foster homes, and my older brother Mike and I to Boys Town. Arriving at Boys Town I was an angry, scared, lonely, and terribly insecure young boy. And, for the next seven years, I was privileged to have toured 48 of the 50 United States, Canada, and Japan as a member of the Boys Town Choir. I remember singing in high school gymnasiums, small town auditoriums, and the enormous fine art centers in almost every metropolitan city in America, normally before a packed audience who never failed to request an encore., When I graduated from Boys Town in 1973 I was a confident and optimistic young man who thought that life in the “outside world” would turn out all right. And it has! Recently, a fellow Boys Town alumnus shared with me that the Boys Town choir has been disbanded. It seems the current executive director of Boys Town feels that music is no longer rehabilitative; you can’t really teach homeless and troubled youth today the same quality music that once resounded throughout Boys Town. Further, he says, teaching young people to sing in Latin is irrelevant and unnecessary: “You can’t be more Catholic than the Pope,” as he likes to say. HERE ARE SOME FACTS concerning quality music and singing in Latin at Boys Town: For 36 years, young boys in Boys Town were really learning and singing quality music, most of it in Latin, with some others in German, French, Spanish, and Japanese thrown in as well. And, they were doing so under the brilliant direction and discipline of probably the most devoted and beloved priest ever to grace the music halls and chapel of Boys Town: Monsignor Francis P. Schmitt, appointed as choir director in 1941 by the homes’ founder, Father Flanagan. Monsignor Francis P. Schmitt was affectionately known by us boys as simply “Father.” His tall and stern exterior was matched by a quiet and unassuming nature. He was, however, colorful, often seen sporting a beret, a Hawaiian shirt, and forever puffing on a Mark IV cigar.. His intellect concerning liturgical church music, classical music, classical and modern literature, and history of the Roman Catholic Church was vast and scholarly. My fondest personal memories of Father Schmitt were the discussions we would have concerning literature and authors. I liked Hemingway. Father detested him, and tried in vain to get me to read the “true quality literature” of his favorite, Willa Cather. “Hemingway is a bum!” he told me, but never once did I sense he felt me a bum for liking Hemingway. Father shared my enthusiasm for literature, and made me feel our discussions were on an equal plane; that my thoughts concerning literature and writers were just as worthy as his own. And, in this same manner he taught us music. Those of us in the choir believed in his faith in our ability to comprehend music, and in this sense Father may have been, for many of us, the first adult figure in our lives who gave us a sense of belonging and worth. Father loved teaching music, and equally loved listening to us learn. Many of us, before the age of 13, were reading and singing Gregorian Chants, Palestrina, Byrd, dez Prez, Handel, Schubert, Mozart, Faure, Britten, Bach, and other choral music of the greats. 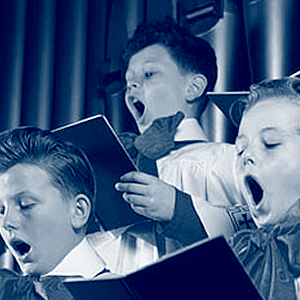 The ability to sing and read music was not a requirement of any young boy entering Boys Town. (In fact, though I lived singing Gregorian chants, I could never master reading the notes properly). I always sensed “first the boy, then the music” from Father. He enjoyed life, and even more, enjoyed sharing our lives. He was a tough task-master who remained steadfast in his music teachings. Choir rehearsals were required and routine. (Great discipline I now think for undisciplined “free-spirited” youth). Not a flat or sharp tone was left to chance in concert performance. Father was tolerant of our slumping postures in the choir rehearsal room, but impatient concerning repeated “basic” music reading and singing mistakes. And, in no uncertain terms did Father condone any choir member blessed with a beautiful voice becoming a primadonna. I thought myself “special” a couple times, Father was right there to firmly take my hand and lead me back to the light of the choir loft and group. Paraphrasing the poet, John Dunne, who Father admired, absolutely no choir member was ever allowed to be an island, separate from the main. Father never demanded a quality concert performance; he expected it. We freely shared with audiences around the country and the world the talents Father Schmitt had shown us we had within us. One memory I have was a scheduled concert in a New England town that was poorly attended because of severe weather conditions. There could not have been more than 30 people in the audience. Having always sung before audiences in the hundreds, this was a real “downer” for us boys, but we did not doubt Father wanted the same quality performance for this small audience we had given others. It turned out to be one of the best concert performances of the entire tour that year. IN THE LATE 1970s, Father Schmitt retired from Boys Town and became pastor of St. Aloysius Church in Aloys, Nebraska. Sometime in the mid-1980s, I visited with him at his church parish. It was a hot summer day, and after giving me a warm embrace, he graciously made me iced tea and sandwiches. “I’m a country pastor now,” he joked with that superb wit of his that I had forgotten about. We visited for hours discussing Boys Town, the choirs and choir tours we shared, writing and authors, and my family. He was very interested in hearing about my family. I gave him a book I thought he might like, and he gave me one from his library. He also gave me an original draft of a chapter from a book he was writing about Father Flanagan in an imaginary inspection of the current Boys Town. I asked him if he missed Boys Town and the choir. He said he was fine with it; he had his small parish choir “to contend with.” But his eyes betrayed him. I knew his eyes, as I had stared into them during hundreds of concert performances. On May 2, 1994, Father Schmitt passed away. 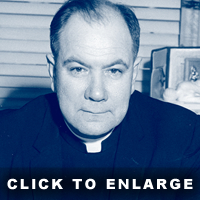 I could not attend his funeral, but I understand a significant number of Boys Town alumni “came home” to Boys Town to pay final tribute to this unique priest who was a giant among boys, and whose spirit lives on like the music he shared with all us. I’m all right with the opinions of the current executive director of Father Flanagan’s Boys Town so long as he does not distort or blatantly dismiss the historical facts of the institution in order to promote his own brand of environment for homeless youth. The fact is that when Father Flanagan was alive it was his fervent belief that teaching and sharing the gift of music with homeless young boys would greatly enrich their lives. I am living proof, as are hundreds of other Boys Town alumni, that Father Flanagan was “right-on” in both his belief and commissioning of Father Francis P. Schmitt to make the music happen. Since the writing of this article in 1994, I have continued—with enthusiasm—my long career in newspaper marketing and management. Currently, I am employed with Hartman Newspapers in Rosenberg, Texas. My wife Jean will be celebrating 36 years of marriage this September, having been blessed with four beautiful, healthy and vibrant children—including two grandchildren—who live and work in the Seattle, Washington area. The liturgical music of my youth still fills my spirit and mind. Early on Sunday mornings, I often sit outside listening to the music of Palestrina, Byrd, des Prez and many others. The music is eternal. It has no beat. Like my soul, it floats effortlessly and freely through the journey of this life. It comforts me; speaks to me in both troubled and happy moments. It heightens my spiritual awareness. It makes the most complicated things in this life both simple and scared. And, something tells me that Father Flanagan and Father Schmitt knew that it would.